Aloe vera: It is the succulent plant mainly grow in dry, tropical areas and having lots of ayurvedic benefits. The scientific name of the plant is Aloe barbadensis. This plant growing up to 60 to 100 cm in height. It belongs to the Liliaceae family. The color of the plant is green, stems are a shout and thick. This plant contains up to 99% of water content so it can survive without water for a long time. The leaves of Aloe vera contains phytochemicals such as anthraquinones, acetylated mannans, amino acid, hormones, carbohydrates, fatty acids, and enzymes, which are very essential for the human body. The margin of the leaves contains a spike. 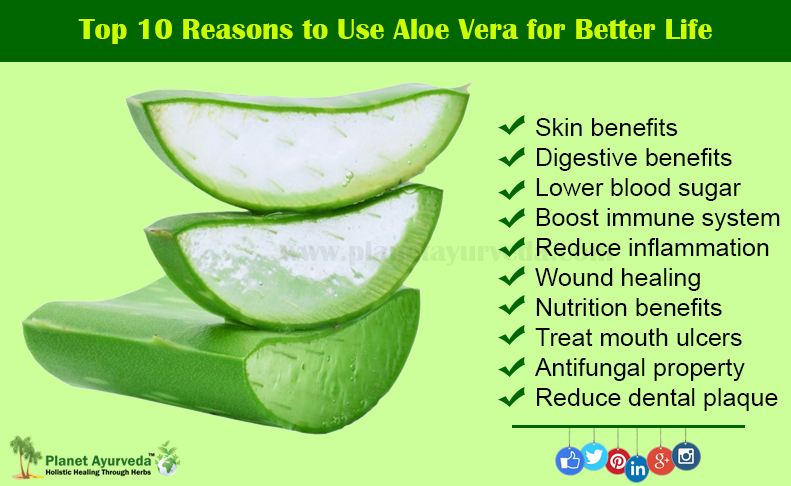 Aloe vera has a very good healing property. In today date this herb is used in almost all skin care cosmetics due to its very good skin healing property. You can also use this herb for various digestive problems and sunburn problems. Vipaka- Katu: It converts into pungent taste after digestion. Reduce bleeding disorder such as heavy periods and nasal bleeding. Aloe vera has a very good anti-aging property which helps us to remove the fine lines form our skin. It also helps to keep your skin smooth and also moisturize it. It is a very powerful anti-inflammatory herb which treats chronic problems like acne, dry skin, psoriasis, and sunburn etc. It gives a cooling effect to your skin. It contains two hormones auxin and gibberellins which provide anti-inflammatory property to it. Aloe vera contains several enzymes which help us in the breakdown of fats and sugar due to it helps in the improvement of our digestion. The laxative anthraquinones present in Aloe vera helps to increase the intestinal water content, and stimulate intestinal mucus secretion. Which helps to improve the problem of constipation in human. It maintains the acid-base and PH balance in the human stomach. It is very beneficial for the people with intestinal bowel syndrome. Diabetes is the lifelong condition in which the blood glucose level is high in patients. Aloe vera lowers the blood lipid concentration in the diabetic patient. It is rich in glucomannan which is a dietary fiber and acts as a hypoglycemic substance which helps to lower the blood glucose level. It can boost the secretion of insulin in a diabetic patient. The various enzymes in aloe vera help us for the breakdown of proteins and provide energy to each and every cell of the human body. The one of enzyme bradykinesia in aloe vera helps to stimulate the immune system. Zinc is also present in aloe vera which helps as a booster for our immune system. Aloe vera contains a very good amount of vitamins and minerals which have very good anti-inflammatory and antioxidant property. It contains Vitamin A and Vitamin C in it. Vitamin C protects our body from cardiovascular disorders and eye and skin problems. In aloe Vera, the polysaccharides helps to increase the cellular movement which helps for faster growth of damaged tissues. Along with polysaccharides glycoproteins also helps to control the inflammatory response and provide relief from pain. The compound glucomannan helps to increase the growth of fibroblast and helps to build new collagen and tissues. 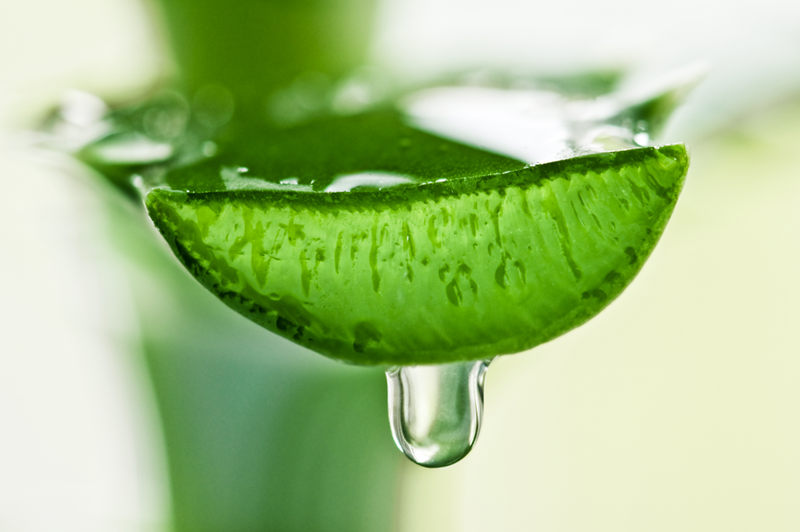 Aloe Vera has a very high content of both vitamins and minerals. It contains vitamin B12, Vitamin C, vitamin A, folic acid. It is the great source of iron, zinc, magnesium, calcium etc. Mouth sores are very common in humans. It can appear on the inner lining of mouth, lips and also on gums and tongue. Aloe vera is very effective for these ulcers. If you can apply the fresh aloe vera gel on these ulcers than it shows great effect. It also reduces the pain due to mouth ulcers. Aloe vera has very good antifungal property. Along with antifungal property, it has also antibacterial and antiviral activity. It contains an active protein which shows these properties in herb. Due to this property, it inhibits the growth of harmful fungus candida. Aloe Vera is very effective in killing the plague producing bacteria such as Streptococcus mutans and yeast Candida albicans in the mouth and reduce the development of plaque on the teeth.